Accompanying the expanded, full-color paperback edition of Dave Tompkins’ critically acclaimed work is a limited edition 7″ record featuring three of the author’s favorite vocoder tracks from the early 1980s. 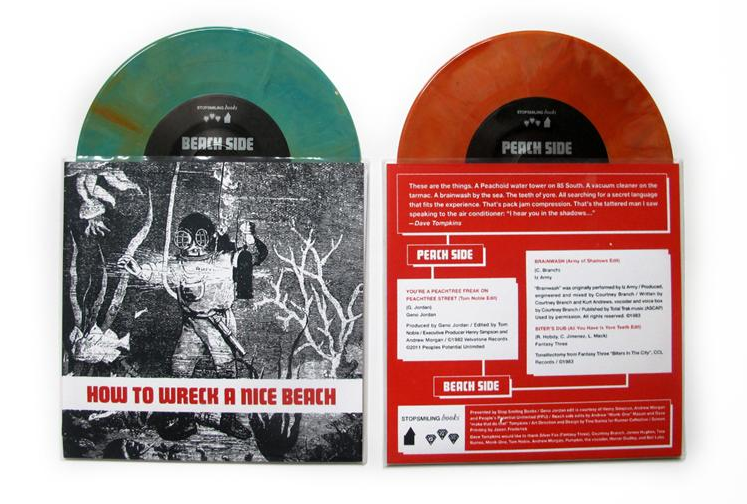 The sleeves, which were screen-printed by hand, present, in the words of Dave Tompkins, “an image of a diver searching for the 50,000 ton vocoder that had been chucked in the Chesapeake Bay after World War II.” Each record is a different color, made from recycled vinyl, and includes a special 8-page booklet detailing the effects of 2001: A Space Odyssey on Jermaine Dupri when he danced at the Swatch Watch NYC Fresh Festival in 1984. This release is limited to 500 copies. Below, Tompkins offers his personal take on each track. Geno Jordan is from Atlanta. This classy, sophisticated grown-up space-funk situation makes the author fondly think of the Peachoid water tower off I-85 South in Gaffney, South Carolina, which admittedly is not Atlanta, but looks like a giant rear end, and will get you there soon enough. “Peachtree Freak” was recorded in 1983, and was originally sourced through Andrew Morgan, owner of the online store Earcave Records and the excellent PPU label in Washington, DC, which specializes in rare boogie, disco and electro-soul. “Brainwash” goes for mad doubloons on eBay, so we’re happy to present this licensed bonus beat, edited by DJ Monk-One and the author. The chorus has an Mtume-ish feel to it. Pretty uplifting for a song about brainwashing. The beat is akin to Human League’s “These Are the Things That Dreams Are Made Of” (particularly the instrumental remix by the late great Martin Rushent). Human League’s dark-wave classic Travelogue really freaked the author out in 6th grade because a.) It had a song called “Being Boiled,” and b.) It had a song about a song that swallowed up all the record stores in the universe. As mentioned in the book, this record literally almost tore the author’s mom’s turntable apart when it refused to surrender the spindle. It just wanted to remain there and keep playing. Like, forever. This is the black hit of space. Fantasy Three were from Harlem, and among many things, should be sainted for mentoring LL and Kool G Rap. Pumpkin’s dub version still remains one of the most futuristic electro tracks ever made. I wrote almost an entire chapter about this song. DAVE TOMPKINS, a former columnist for The Wire, writes frequently on hip-hop and popular music. His work has appeared in Vibe, The Village Voice, Wax Poetics, and The Believer. Nearly a decade in the making, this is his first book. 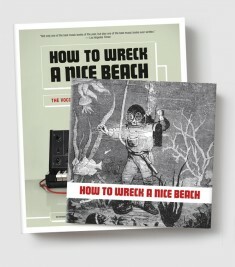 Pitchfork picks "How to Wreck a Nice Beach" as one of its "60 Favorite Music Books"